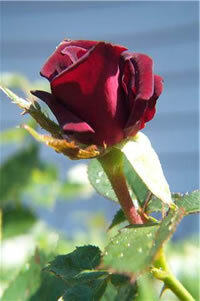 The rose Black Jade was first introduced in the United States in 1985 and bred by Frank Benardella. Frank Benardella passed away in January 2010 but he earned worldwide acclaim as a specialist in breeding miniature roses with hybrid tea forms. 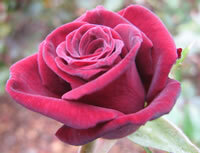 The Black Jade was created by crossing the hybrid tea Laguna rose with the Sheri Anne rose. The result is a shade loving dark red miniature rose that is credited with being as close to black as any rose ever created. Black Jade roses are extremely hardy and can thrive in zones 4 through 10 with proper freeze protection. This variety is a repeat bloomer that will produce multiple flushes during the growing season. Each bloom averages about 1 inch in diameter with a subtle fragrance. If grown in a full sun location, the blooms will take on a near black color, while partial shade growing conditions will offer the more rich colors of red. The blooms on the rose Black Jade are very full for such a small rose, carrying as many as 40 petals each. The rose Black Jade is very versatile in the garden and can be adapted to fit a wide range of growing locations. They are often grown in containers on patios and porches and will reach heights of about 2 feet tall. You will often find this rose in small landscaping ideas as well however if you do decide to grow this rose in a container, make sure that you give it adequate protection from the freezing temperatures. The blooms on the Black Jade are usually solitary, making this an excellent choice for cut flower arrangements or bouquets. Because Black Jade roses are repeat bloomers, you really should try to provide them with ample sun light if you are able. The result will be far more impressive blooms and you will see more of the highly desired near black blooms if you do. The number of rose varieties that can do well in shady locations is low by comparison so it is tempting to use these varieties when available, in garden designs that others will not adapt to. The rose Black Jade is more than happy to accommodate whichever type of location you prefer. Keep in mind however that the Black Jade is susceptible to mildew, so at the very least, find it a spot where it will not stay damp for long periods of time. 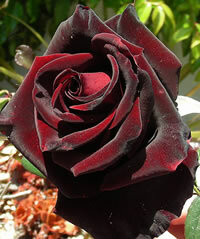 Planting the rose Black Jade is very easy and the biggest decision you will have to make is where to plant it. If you decide to go with a container, then you should find yourself a potting soil that drains well, but still offers some degree of moisture retention. Container plants in general tend to dry out very quickly and require more attention than ones planted in the ground. If you are going to plant Black Jade roses in your garden or flower bed, then I suggest before you start digging, you take a trip to the local garden center and pick up a bag of organic compost. Most place carry it and it's usually pretty inexpensive. When you dig the hole for your rose, mix the compost in with the loose soil at a ratio of 2 parts soil to 1 part compost. This will give your rose Black Jade that added boost it needs to get established quickly. You can also mix the compost in with your potting soil if you feel it is not adequate. If you got your rose Black Jade from an online retailer, then they most likely shipped it to you as a bareroot plant. This is common however prior to planting you should soak the plant overnight in a bucket of lukewarm water. Dig yourself a hole that is plenty wide enough to handle all the roots that came on the plant, and deep enough so that you can mound up some of your potting mix in the center and set the plant with the bud union about an inch or two below the surface of the soil. If you bought your Black Jade roses locally, then they were probably already planted in a container and ready to bloom. For these, I will dig a hole at least twice the diameter of the container and equally as deep. This gives you a lot of room for your new soil mix but it still maintains the same bud union depth that the rose had in the container. 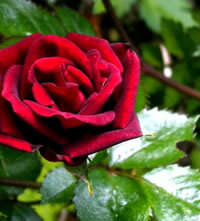 Taking care of the rose Black Jade is not difficult and you can pretty much follow basic rose care maintenance. A good rule of thumb is to provide your roses with one good deep watering each week, however if you are growing the Black Jade in a container, you will have to monitor it closely as containers tend to dry out very quickly. You can also give your rose Black Jade an all-purpose granular fertilizer in the early spring when the leaves start to form. Since this is a repeat bloomer, I often give them another feeding when the first big bloom starts to form, and one more in mid-summer to promote additional flushes of blooms. Since the rose Black Jade only grows about 2 feet high, pruning it is a snap! Always prune in early spring before the leaves open up. Start by cutting off any dead wood as well as any canes that look discolored or diseased. Next, cut back any overlapping canes as these will compete with one another for sun light once the leaves open. Lastly, trim back the remaining canes about one third of their current height to promote new growth. I always use this time to clean up around the base of my roses as well, cleaning up any dead leaves or debris that has collected around my roses. 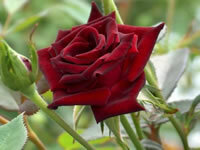 Never let decaying matter lay at the base of your roses as these could lead to pests and diseases infecting your plant. Also dispose of all cuttings and debris in the trash, never throw them onto the compost pile as some spores can survive even over winter to reinfect plants the following season.